Nope, I'm not referring to the old movie nor the theme song sung by Diana Ross. It's the envirnomental theme of Bilar's mahogany forest. 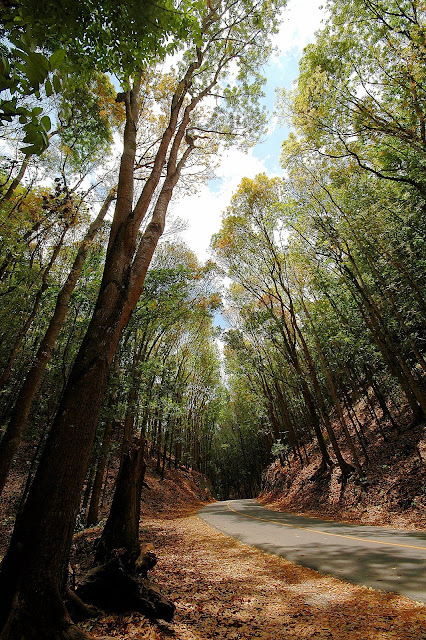 Driving through kilometers of mahogany trees providing their canopy is a sight to behold. Planted over two decades ago by volunteer students and residents, the trees are priceless not just for their timber but for the shade they give, the sloping land they hold together, not to mention the fresh oxygen they provide. Sana, marami pang ganitong sa Pilipinas. At sana, hindi naman ito pagdiskitahan ng mga loggers. Love this shot! Very good use of wide angle. Parang gusto ko tuloy mag stroll dyan ngayon. ang ganda naman nito... sir anong camera at lens ang gamit mo dito...? ei ferdz! it's as breath-taking as the picture suggests. lino, sigma 10-20mm and nikon d70 ang ginamit ko for this image :-) glad u liked it. sana hwag napagtripang putulin yang mga puno na yan. gandang tignan at talagang nakakatulong na pagtakip sa matinding init ng araw. speaking of canopy, pwedeng pwedeng atang maglagay ng capony walking facility dyan. one of the best shot in this bohol set. i'm planning to be in bohol by end of may. pinag iisipan ko pa kung bohol or bantayan or malapscua island. by the way, can i borrow this photo to be placed in the bloggurs in line with your interview. para makita nila yung mga photograph na ganito? I like the ambiance of the road, I hope i can visit there someday. So excited to see that part.